The number of deaths at sea as a result of people crossing the Mediterranean into Europe, in order to avoid conflict, persecution and economic deprivation rose to record levels in April 2015. According to the United Nations (UN) Refugee Agency, 479 refugees and migrants drowned or went missing between January and March, as opposed to 15 during the first three months of the year before. In April 2015, 1,308 refugees and migrants went missing or drowned in a single month. However, there were declines in death in the months of May and June with the number of deaths being 68 and 12  respectively. Since the beginning of 2015, approximately 153,000 migrants have been detected at Europe's external borders according to Frontex, a 149% increase compared to the 2014 figures of the same period; in May, some 19 000 migrants used the Eastern Mediterranean route - a 32% increase since April. The demographic of people risking everything by crossing the Mediterranean Sea to Europe are people from impoverished and war-torn countries in Africa, the Middle East and central and south Asia. The use of the Mediterranean Sea by people fleeing issues such as war torn countries should not come as a surprise. This is because, given its geographic position, the Mediterranean Sea serves as a hub between Europe, Africa and Asia. It is as a result of this that makes the Mediterranean a popular route that is susceptible to migration. Over the years and presently, one of the most sensitive issues not given consideration whilst referring to those crossing the Mediterranean is the terminology used in referring to them. In the face of such problems, terminology and the rhetoric of migration proves to be an important issue because it plays a vital role in the public reaction to a problem. For example, the US president, Barack Obama’s reluctance to label the fight against terrorism as a war against radical Islam or any kind of religious war  creates an opportunity to work with Muslim communities in the fight against terrorism, without stigmatizing particular religious groups. Similarly, the use of terms in referring to those crossing the Mediterranean Sea may have implications on whether these people are deserving of protection or not. The authors therefore argue that terminology must be used carefully and with sensitivity in order to avoid generalizations that have the potential to create a social stigma of criminality. What is wrong with using the term “migrants”? The politicisation of terms such as ‘refugee’, ‘migrant’ and ‘asylum seeker’, and the criminalisation of ‘irregular migration’ has been labelled recently by the Council of Europe’s Parliamentary Assembly (‘PACE’) as a ‘crime without a victim, often leading to the deaths of many migrants and creating the opportunity for lawbreakers or criminals to benefit from the offence’. PACE has recognized that it has become increasingly difficult to emigrate and immigrate lawfully or freely. It therefore becomes easier for a State to ignore their obligations by using different terminology to blame the victim, rather than take steps to ensure that their domestic policies are in compliance with norms of international law that were designed to protect refugees and asylum seekers. European Union member states have often been criticized for failing to protect those escaping wars or internal conflicts and have relied on their domestic border control policies to deny protection. Most notably, in a case decided by the European Court of Human Rights in 2012, Hirsi Jamaa and Others v. Italy ,  , the Court heard that during a press conference on 7 May 2009, the Italian Minister of the Interior, Roberto Maroni, tried to justify the government’s decision to return those it intercepted to Libya, stating that ‘the interception of the vessels on the high seas and the return of the migrants to Libya was in accordance with the bilateral agreements with Libya that had come into force on 4 February 2009, marking an important turning point in the fight against clandestine immigration’.’ In May 2015, the British Home Secretary, Theresa May also labelled those crossing the Mediterranean Sea as migrants whilst speaking to Sky News. The use of the term ‘migrants’, by politicians such as Theresa May, may have implications on the true nature of people or persons crossing the Mediterranean Sea. The term ‘migrants’may simply translate to people or persons crossing the Mediterranean to seek greener pastures. Therefore, it is not surprising that some politicians speaking on the Mediterranean crisis place migration and economy side by side. For instance, Theresa May maintained that “‘economic migrants crossing the Mediterranean to seek better lives in Europe should be returned to Africa to thwart the terrible callous trade in human beings.” ’ Whilst Theresa May, uses Human Trafficking to justify non surrogate protection to those at the Mediterranean Sea, she uses the term economic migrants to first portray that those at sea are only fleeing for economic reasons and thus not deserving of protection, second, and lastly, that those economic migrants, who may have a negative effect on the economy, are once more not deserving of protection. 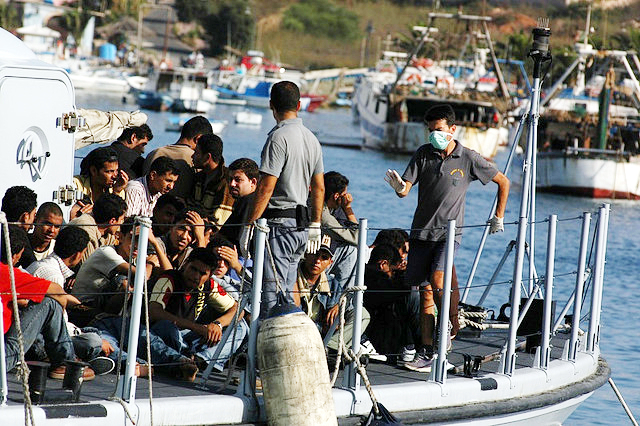 The authors reject the term ‘migrants/economic migrants’in the context of the Mediterranean crisis as a result of its negative connotation above, and because when the term ‘economic migrant’ is used, it does not accurately represent the true demographic of those involved in the Mediterranean crisis which includes asylum seekers, trafficked and smuggled victims. The term ‘refugees and asylum seekers’ is commonly used by the UNHCR. The UNHCR uses the term to remind States of their obligations under refugee law: to aid the repatriation and resettlement of people displaced by the war or internal conflict. Seeking asylum is a fundamental right protected under international law. Refugee and asylum law creates positive obligations for States to protect refugees, defined as “‘those fleeing persecution’. A ‘refugee’, is defined under the UN 1951 Convention and 1967 Protocol Relating to the Status of Refugees (the ‘Refugee Convention’), as a person who ‘owing to a well-founded fear of being persecuted for reasons of race, religion, nationality, membership of a particular social group, or political opinion, is outside the country of his nationality, and is unable to or, owing to such fear, is unwilling to avail himself of the protection of that country’. The use of the term ‘refugee and asylum seeker’, and refusal to use the term migrant may be explained. First, as politicians use the term migrant to gain popularity in their quest for migration control, the UNHCR, the agency mandated for refugees and asylum seekers use the terminology refugee and asylum seekers to bring attention to those they are mandated to protect. The UNHCR may be following a more correct approach in referring to those involved in the Mediterranean crisis as ‘asylum seekers’ as the demographic of those involved in the Mediterranean crisis are fleeing unrest in the Middle East and the African region (most notably Libya and Eritrea). However, while the use of the terms asylum seekers and refugees brings forth the notion that those involved in the Mediterranean crisis are people or persons deserving of protection, it does not encompass smuggled persons. The last developments and unrest have had a significant impact on the lives of people that attempted to escape in search for safety in European soil by crossing the Mediterranean Sea.. The failure of EU member states to ensure that no more victims would perish at sea is a result of the significant impact that terminology has on tackling the ongoing Mediterranean crisis. In the context of the Mediterranean crisis, terminology proves important as it determines public perception and the international community response to the crisis. However, while the authors note that at least the term ‘migrant’ is all encompassing for those crossing the Mediterranean, its usage has been debunked by the authors for reasons already provided. In addition, although the usage of the term ‘asylum seekers and refugees’ proves subtler, its usage has also been debunked because, not all those involved in the Mediterranean crisis are asylum seekers or refugees. Therefore, the authors propose that when referring to people or persons involved in the Mediterranean crisis, the term ‘Persons in Need of Assistance or Relief’ should be used. This is because, first the term encompasses all those involved in the Mediterranean crisis which includes, asylum seekers and refugees, economic migrants, and smuggled and trafficked victims. Second, it brings forth the notion that the motive for those risking their lives crossing the Mediterranean Sea is to gain assistance. Andreas is a lecturer in constitutional and administrative law at the University of Bedfordshire and Fellow of the Higher Education Academy. He holds an LLB Law (Honours), Masters in International Law from King’s College London and a Doctorate of Philosophy (PhD) that was obtained with a scholarship award. Andreas specializes in human rights law and often acts as external adviser to civil society organisations and the Council of Europe. He has involvement in third party interventions to the European Court of Human Rights and has authored multiple publications within his area of expertise. His research interests lie in public international law and human rights, with emphasis on the right to freedom of thought, conscience and religion, as well as sexual orientation and gender identity, non-discrimination and equality. In his research, Andreas investigates the overlap between human rights and seeks to find a balance between competing interests. UNHCR, Mediterranean Crisis 2015 at six months: refugee and migrant numbers highest on record. Press release, 1 July 2015. CNN politics. Why Obama won’t call radical islam terrorism. Recommendations by PACE, The interception and rescue at sea of asylum seekers, refugees and irregular migrants, Doc 11880, 29 April 2009.